Canada is the world's second largest country by area but its population, at slightly less than that of the state of California, is small by comparison. Canada's largest cities are Toronto, Montreal, Vancouver, Ottawa, and Calgary. Even with its small population, Canada plays a large role in the world's economy and is one of the largest trading partners of the United States. The first people to live in Canada were the Inuit and First Nation Peoples. The first Europeans to reach the country were likely the Vikings and it is believed that Norse explorer Leif Eriksson led them to the coast of Labrador or Nova Scotia in 1000 CE. European settlement did not begin in Canada until the 1500s. In 1534, French explorer Jacques Cartier discovered the St. Lawrence River while searching for fur and shortly thereafter, he claimed Canada for France. The French began to settle there in 1541 but an official settlement was not established until 1604. That settlement, called Port Royal, was located in what is now Nova Scotia. In addition to the French, the English also began exploring Canada for its fur and fish trade and in 1670 established the Hudson's Bay Company. In 1713, a conflict developed between the English and French and the English won control of Newfoundland, Nova Scotia, and Hudson Bay. The Seven Year’s War, in which England sought to gain more control of the country, then began in 1756. That war ended in 1763 and England was given full control of Canada with the Treaty of Paris. In the years after the Treaty of Paris, English colonists flocked to Canada from England and the United States. In 1849, Canada was given the right to self-government and the country of Canada was officially established in 1867. It was comprised of Upper Canada (the area that became Ontario), Lower Canada (the area that became Quebec), Nova Scotia and New Brunswick. In 1869, Canada continued to grow when it bought land from the Hudson’s Bay Company. This land was later divided into different provinces, one of which was Manitoba. It joined Canada in 1870 followed by British Columbia in 1871 and Prince Edward Island in 1873. The country then grew again in 1901 when Alberta and Saskatchewan joined Canada. It remained this size until 1949 when Newfoundland became the tenth province. Because of the long history of conflict between the English and French in Canada, a division between the two still exists in the country’s languages today. In Quebec the official language at the provincial level is French and there have been several Francophone initiatives to ensure that the language remains prominent there. In addition, there have been numerous initiatives for secession. The most recent was in 1995 but it failed by a margin of 50.6 to 49.4. There are also some French-speaking communities in other portions of Canada, mostly on the east coast, but the majority of the rest of the country speaks English. At the federal level, however, the country is officially bilingual. 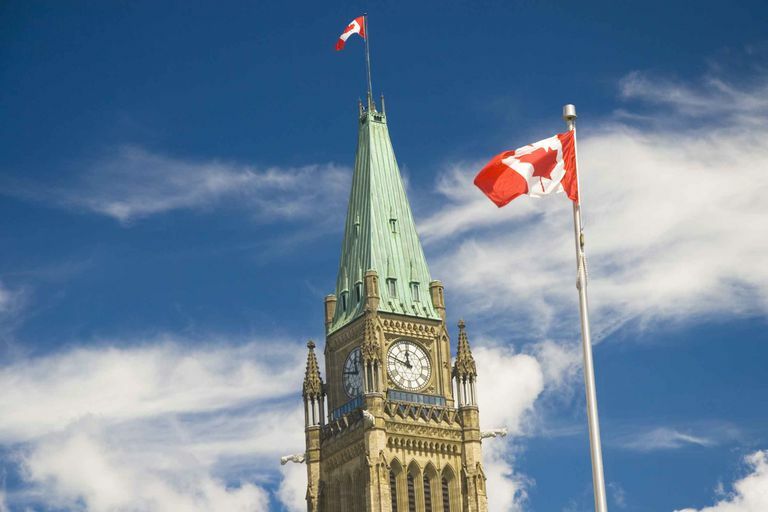 Canada is a constitutional monarchy with a parliamentary democracy and federation. It has three branches of government. The first is the executive, which consists of the head of state, who is represented by a governor general, and the prime minister, who is considered the head of government. The second branch is the legislative, a bicameral parliament consisting of the Senate and House of Commons. The third branch is made up of the Supreme Court. Canada’s industry and land use vary based on region. The eastern portion of the country is the most industrialized but Vancouver, British Columbia, a major seaport, and Calgary, Alberta are some western cities that are highly industrialized as well. Alberta also produces 75 percent of Canada’s oil and is important for coal and natural gas. Canada’s resources include nickel (mainly from Ontario), zinc, potash, uranium, sulfur, asbestos, aluminum, and copper. Hydroelectric power and pulp and paper industries are also important. In addition, agriculture and ranching play a significant role in the Prairie Provinces (Alberta, Saskatchewan, and Manitoba) and several parts of the rest of the country. Much of Canada's topography consists of gently rolling hills with rock outcrops because the Canadian Shield, an ancient region with some of the world's oldest known rocks, covers almost half of the country. The southern portions of the Shield are covered with boreal forests while the northern parts are tundra because it is too far north for trees. To the west of the Canadian Shield are the central plains, or prairies. The southern plains are mostly grass and the north is forested. This area is also dotted with hundreds of lakes because of depressions in the land caused by the last glaciation. Farther west is the rugged Canadian Cordillera stretching from the Yukon Territory into British Columbia and Alberta. Canada's climate varies with location but the country is classified as being temperate in the south to arctic in the north. Winters, however, are normally long and harsh in most of the country. Nearly 90 percent of Canadians live within 99 miles of the U.S. border (because of harsh weather and the expense of building on permafrost in the north). The Trans-Canada Highway is the longest national highway in the world at 4,725 miles (7,604 km). Which U.S. States Border Canada? The United States is the only country that borders Canada. The majority of Canada's southern border runs straight along the 49th parallel (49 degrees north latitude), while the border along and east of the Great Lakes is jagged. "The World Factbook: Canada." Central Intelligence Agency. 21 April 2010. Statistics Canada. “Canada's Population Estimates, Third Quarter 2018.” 20 Dec. 2018. 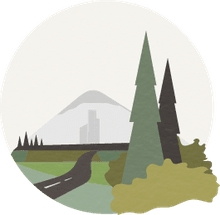 Do You Know These Interesting Geographic Facts About Oregon?